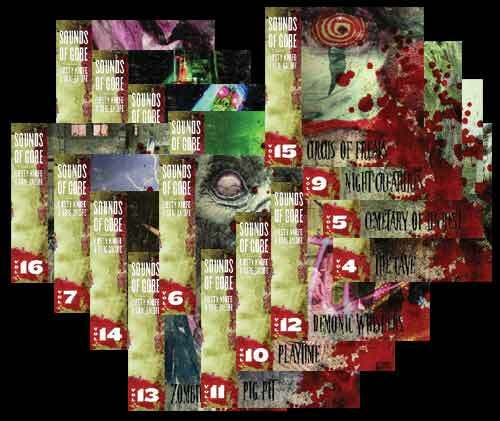 One 60 minute track of Ferocious creatures roaming the landscape hunting their prey, YOU! Your one stop shop for Halloween Music and Haunted House sound effects! 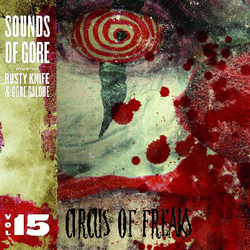 We have everything from Gore Galore's exclusive Sounds Of Gore library, Midnight Syndicate, Virgil, Hedstorm Productions, haunt rocker Jerry Vayne, Mark Harvey's Pumpkinland series, Rustyknife, Audio Zombie, Something Wicked Productions, Grave Gear Studios, Eban Schletter, Night Sound Records, and more will be added as they become available. We specialize in haunted house, haunted attraction sound effects, soundscapes, scary sound effects, halloween audio, Halloween Party Music, spooky audio, and haunt audio. One 60 minute track of a dark Post Apocalyptic world filled with dread and haunted by ponderous giants who consume the souls of all those they encounter. Listen for the heart piercing sirens for they warn of the danger of the approaching doom. This is based on a new CD concept. It can be used to set up a scene with the actor playing to the musical score. the CD is setup like a storyboard. The actor just has to play out the storyline. One 60 minute track of a Freaky Circus Carnevil. We have been working on this one a while. You won’t be disappointed.